Forty acres have been replaced with natives at La Costa Golf Course. Photo courtesy Union-Tribune. The U. S. Open was a couple of months ago, but I am just catching up with a ripple effect from this event that is related to our main interest: native plants. 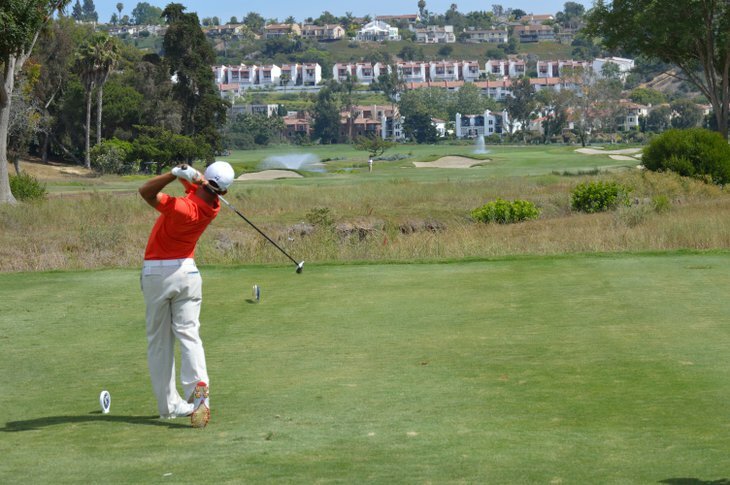 The San Diego Union-Tribune newspaper, which knows its audience, published an article about the New Brown in golf. Moving from that intense green of super-manicured turf to a more natural look is going to be difficult for many. Golf is an important hobby and tourist attraction in San Diego, so this really hits home. The water use statistics, let alone the environmental impact form the synthetic fertilizers, etc. is just too much for today’s world. Pinehurst, the venue for the U. S. Open, had a different look this year. It was showing off the U.S. Golf Association’s “brown is the new green” initiative. Locally, courses have had to adapt. The article in the Union-Tribune quotes Sandy Clark, the longtime superintendent of Barona Creek Golf Club as saying, “What Pinehurst represented to the public is that this is OK. We don’t have to be wall-to-wall green. I think it’s going to break the barrier for the industry in terms of what we think we can and cannot do. ← Would you like to hear some good news? Another direction to take golf courses would be to create mixed grass courses – using different native grasses in a way that you might find them in nature – only occasionally cut. I can see using Carex pansa over some areas, Festuca rubra over others, Carex praegracilis, and Danthonia californica in others. Great idea. Has anyone ever golfed in Scotland? Would this mixed grass idea look more like what the original courses were like? I’ll make a note to get in touch with the Golf Association at some time in the near future.